"Oh my gosh, we go through so much peanut butter!" 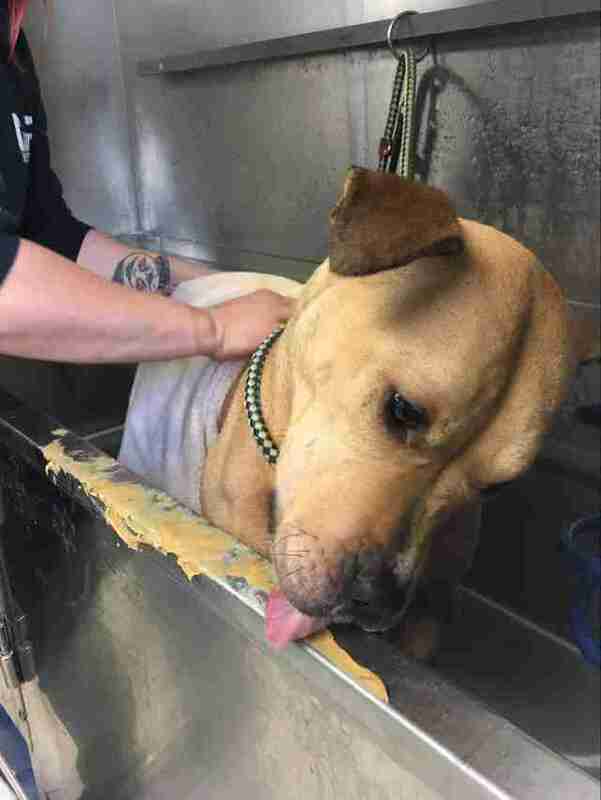 Epic came into Detroit Dog Rescue (DDR) with some very bad wounds. The dog's neck had deep gashes around it, likely from having a too-small collar on for too long. Old scar tissue indicated that this wasn't the first time he'd suffered. Kristina Millman-Rinaldi's promise to Epic and the other dogs at the no-kill shelter she founded is that their lives will be filled with calm, loving experiences — but first, they need a bath. 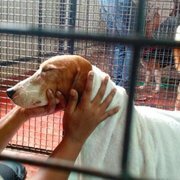 Bath time can be stressful even for dogs with the most luxurious lives. This goes double for Detroit Dog Rescue's dogs, who've often endured abuse and struggle before coming into the shelter. 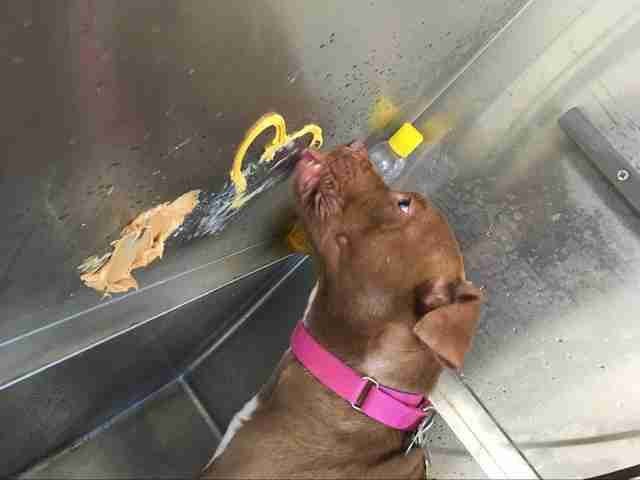 So Millman-Rinaldi and her staff do one simple thing to help Epic and the other dogs learn to enjoy their baths: smear lots and lots of peanut butter on the shower wall. This program is called "Peanut Butter Bath Time." The idea is that dogs get so distracted by their tasty treat that they often forget to be terrified — plus they start to associate bath time with delicious rewards. 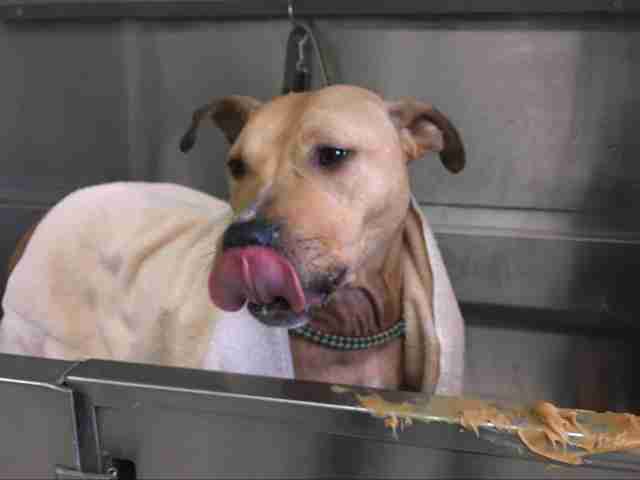 "Oh my gosh, we go through so much peanut butter at Detroit Dog Rescue! Over 40 jars per month," Millman-Rinaldi told The Dodo. Jif is the preferred brand: "the largest jars we can find." Those 40 jars aren't used just for bathing — the shelter generally has almost 90 dogs in residence at a time and they get rewarded for lots of new experiences. DDR uses peanut butter — as well as other treats, like cheese — to make every activity and training session, even medical procedures, as good a time as possible. "Detroit Dog Rescue’s whole entire animal care program is centered around positive reinforcement and force-free handling," Millman-Rinaldi said. This mission is deeply and personally important to Millman-Rinaldi. She was abused as a child and remembers what it was like being in new and uncomfortable situations. She also remembers the people who helped her through. Millman-Rinaldi and her staff play that role for dogs like Echo. "I’ve been right where these dogs are, a lot of people on our staff have felt like these dogs, so we do everything possible to make them feel confident and loved," Millman-Rinaldi said. "It takes patience, it takes enrichment, it takes thinking outside of the box. And a lot of peanut butter. So much peanut butter." Follow Detroit Dog Rescue on Facebook. Here's where you can donate.